A snug-fitting cowl in nice bright colours was required to wear with my raincoat - my other cowls are all too big to fit in the narrow neck space, especially when the hood is up. This little stashbusting project was the perfect solution and was hooked up in just a few hours. Beginning with a chain of 80 I joined it to work one-piece (I didn't want to sew it up) although I actually went back and forth across the rows after slip stitching the last stitch of each row into the first, this made it look neater at the colour changes. The 4mm hook made for a nice dense fabric that keeps it's shape well and for this reason there are no chain spaces beween the groups of trebles. I like it so much I might make another one in different colours. I think I know a little lady who might like one too! For more finished objects visit Tami's Amis. Now that looks cozy! Great idea for using up stash. I might have a rummage in my hoard and see if I've got anything that would work for this idea, because it looks lovely. LOVE IT! the colors are fabulous! such a great idea for using up the ends of a skein. The colors are AWESOME! What a fun stashbuster. That's a great one! Love the colors. I need to make something with granny stripes too! Every time I see them I love them a little more - especially in the colors you've chosen! This is so beautiful! The colours, the grannystripe... oké, another thing to write in my little book! 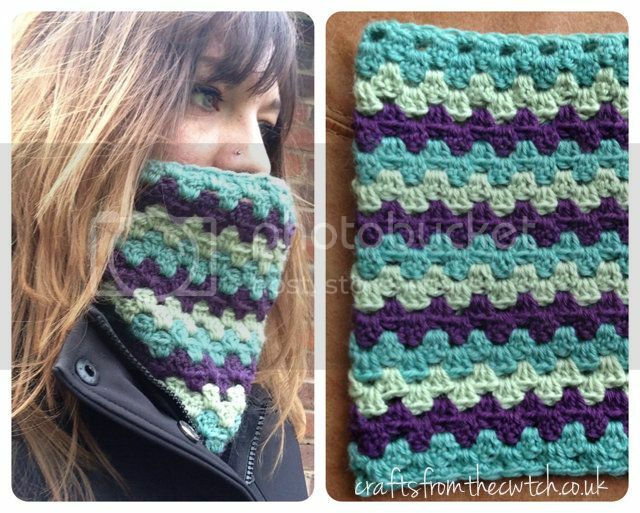 ooh it never occurred to me to use a granny to make a cowl.. must try this now!